Last Fall BMW teased Winter Olympics fans with a concept sketch of the two-man bobsled it was designing for the U.S. Men's Bobsled Team. But with the season officially starting this past Saturday, the design, which will hopefully help the two-man team win their first gold medal since 1936, was finally unveiled. 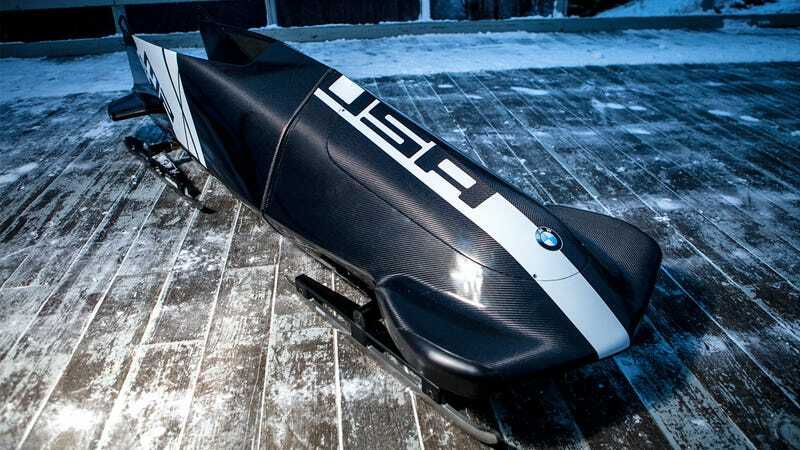 Underneath its paint job, the bobsled's exposed carbon fiber body just screams speed. But to most fans it probably doesn't look that different from the bobsleds used by other countries, because of stiff regulations on the designs. So BMW used its expertise in vehicle engineering to reconfigure the weight distribution in the new sled, lightening the body shell so the center of gravity was lower and more centralized. Will it result in faster times and a better shot at a gold medal? Only time will tell as the bobsled is refined and perfected through international competition leading up to the Olympics. But the question remains, how do we know that BMW, a Germany-based company, isn't secretly sabotaging the US team's efforts to win the gold?